Here’s something different as Jonathan Syrett at Camper & Nicholsons sends news of a price increase on his central listing, the 23.4m Pendennis sailing yacht Ocean Phoenix. The increase follows a thorough eight-month refit that includes deck and mast conditioning, hull sanding and recaulking, new equipment, entire interior redistribution to provide an additional crew cabin, complete new galley in a new location, new upholstery, all resulting in a lighter, faster performance cruiser. 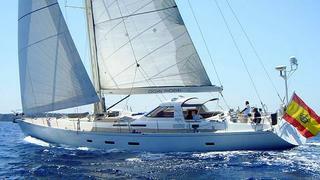 With accommodation for seven guests, the new asking price of Ocean Phoenix is €1.295 million.